Bargain Hunters Alert: New Place To Score–Bloomies! 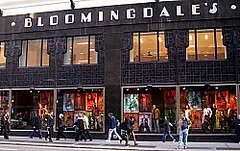 Parent company Macy’s is opening outlets on the east coast for its’ high end store, Bloomingdale’s. The new outlets initially to be located from New York to Florida will carry clearance apparel and accessories. This is a new trend for luxury stores and now Bloomies joins the ranks of Neiman Marcus, Saks, and Nordstrom in catering to a clientele like MarkdownMom who hunt for deals to live elegantly on a budget. Obviously, this is a reality check for retailers that traditionally cater to an upscale clientele in these tough economic times, but for frugalistas and fashionistas alike– get your running shoes on! A New Outlet For Bargain Hunters! Let The After Christmas Clearance Begin! As MarkdownMom prepares to weather out what local stations are calling a mega storm in the Twin Cities, post holiday season clearance sales are gearing up. Although retail has picked up, the stores still have to meet lagging figures for the year and have decided to pre- empt after Christmas clearance sales by gearing up and offering red hot deals now. QVC and HSN shopping networks are currently offering current season fashion and jewelry at 40%-60% off including offerings by their top designers Sherry Cassin. Her Illusion line for HSN has some spectacular deals like her reversible coat in either Black Chinchilla or Bronze with faux fur and sash–two looks for one! Reg. price of $429.00, new red hot sale priced $199.90 with 3 flex pays! Remember, the better the bargain, the faster that quantities, colors and sizes become limited. What better way to say let it snow, then to go online and shop, shop, shop and get the jump on these bargains! ‘Tis the season for fashionista,frugalistas,and bargain hunters, but MarkdownMom has been M.I.A. What gives? Has she lost her nose for finding terrific bargains? Is she suffering from bad economy ennui? Au contraire! She decided, perhaps “decided” is the wrong term, she ended up in the hospital and has been out of commission for over a month. At peak holiday sales, who says timing is everything. Well, she is on the road to recovery, so get ready to stretch that dollar and look good girl while you’re doing it! It use to be that you had to shop the off brands in the New York garment district to find designer knock-offs. Not anymore. With a tough economy the designers are creating knock-offs of their popular designs sometimes at two price levels. For instance, some designers have brought to the home shopping networks their lines at considerable savings, and then to middle income store chains like Target, another line even more affordable. Such is the case of Carlos Falchi. With 30 years in design, Falchi is noted for his high end, couture handbags. These wonderful creations made out of premier leather, snakeskin and with his signature luxurious abstract linings, even at $1000 retail many buyers have become lifetime collectors of his handbags. Recently, he expanded his line to include apparel, jewelry and accessories on HSN. And this month he has cast his design net of his handbag line to mainstream distributors like Target. Now you won’t get real leather or snakeskin or all the bells and whistles of a $1000 handbag by Falchi, but you will get the “look” with its’ signature lining incorporating the target symbol, for $19.99+! 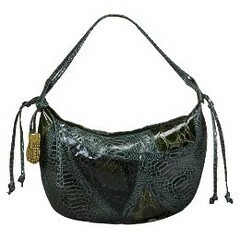 Like this faux snake hobo in purple, green or black. Can’t argue with that price point and it’s still an original Falchi handbag, not a knock-off. Remember, now you can make a fashion statement at a price that won’t break your budget! How Much Do You Want To Pay For Fashion This Fall, 2009? Runway Designers this year are cost-cutting, doing their own knock-offs of their runway hits for online shopping networks. One of their main themes has been to update your present wardrobe with accessories or add that one indispensable piece at cut rate prices. However, as much as we love the designers finds and their designs, for many of us owning these items is still cost prohibitive. But look around and you can have these looks at one-fourth the cost. For instance, one of the hottest trend setters who have dressed the rich, the famous, and the infamous is Rachel Zoe. At QVC, she premiered this North/South hobo handbag–a hot and trendy look this Fall, msrp $152, qvc price $122. 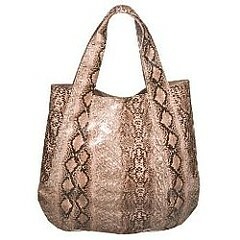 Made from PVC, cotton lining this popular handbag has a side zip and comes in shades of natural, green and brown snakeskin print. 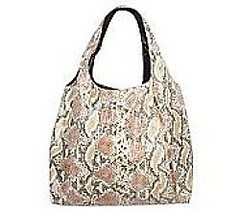 At Target™, you will find this Hollywood Intuition Snake Tote in natural for $22.00. Made from polyester with interior pocket, the straps are not as long as Zoe’s handbag,there will be a difference in texture and materials used, but again, here is the look at a fraction of the cost, in stores and online. You Decide What You Want To Pay For Fashion This Fall!